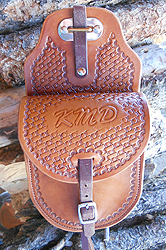 Saddle pocket in the true sense of the word! 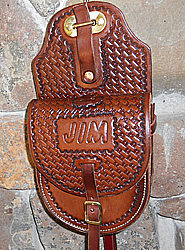 For those who may not want large saddlebags or pommel bags these Sharp designed custom saddle pockets are super handy! Attach saddle pocket anywhere on your saddle with a footman loop. (As long as you can screw 2 screws into your saddle tree, not recommended for ralide/plastic trees). 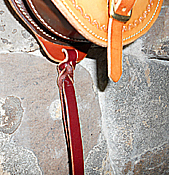 The footman loop (included) stays permanently attached to your saddle. 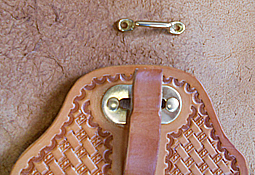 Leather tab slips into footman loop (as seen in photo) for secure attachment, yet can be easily removed so you can take your saddle pocket off/on without hassle. 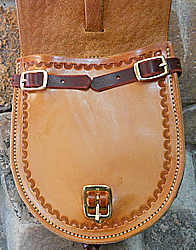 Leather string at the bottom holds saddle pocket from bouncing (see photo). Sharp's saddle pockets are 7" deep 6" wide. Sewn leather gusset hold it's shape so you don't get that "gusset sag." 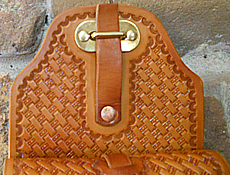 More quality construction features include straps inside (see photo) under flap to hold contents inside.